Three overnight carriageway closures are required this week as part of the Highways Agency’s £106m investment to improve the A45/A46 Tollbar End roundabout and A45 Stonebridge Highway and Stivichall Junction. The 1.5 mile section of the A45 Stonebridge Highway westbound carriageway from Tollbar to Stivichall roundabouts will close, from 8pm until 6am between Thursday 16 October and Saturday 18 October inclusive. At the same time, lane two of the eastbound carriageway will also be closed to provide an adequate safety zone to protect the workforce. The closures are to allow installation of ducts for street lighting, as well as surfacing and road marking works. Following completion of the works, traffic will be switched on to the new section of the A45 Stonebridge Highway. This essential work can only be done safely by closing the carriageway. Although the work is taking place on the westbound carriageway, we need to also close one lane of the eastbound carriageway in order to ensure the safety of the workforce. As there is less traffic overnight, we’ll be doing the closures then, but we still advise motorists to allow extra time for their journeys on these dates. The diversion routes may be unfamiliar to some drivers so we urge them to take extra care, and to drive safely. Road users wishing to travel westbound on the A45 Stonebridge Highway should follow the clearly signed local diversion: at the junction of A45 and Tollbar roundabout onto the B4110 London Road, then onto the A4082 and onto the A444. Traffic will join the A45 at the junction of the A444 and A45 where the diversion ends. 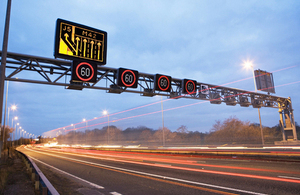 When completed, the Tollbar scheme will improve capacity, journey times and safety. Around 45 percent of traffic will be taken from the Tollbar roundabout onto the new underpass. Access to local businesses and Coventry Airport will also be improved, as will pedestrian access at the roundabout. To find out more about the A45/A46 Tollbar End Junction improvements visit the scheme’s website.